The girl stands alone in the throne room, looking around in wide-eyed bewilderment. Chances are, she didn’t expect to end up here. Chances are that she had no idea where she was. From where I sit I can see through her figure, as if she were a ghost of some type. For all intents and purposes, she is. This realm is not her realm, and her physical body lies far away, safely tucked into bed somewhere. She doesn’t see me as. Her eyes are taking in the rich marble columns, the vaulted ceilings, the tapestries, the pillars of candles, and the twin thrones at the front of the room. I could sneak up behind her and slip a blade into her ribs before she’d notice me. Well, technically I could do that anyway, if I had half the mind to do so. Instead, I watch. The throne room is not forbidden, not even to mortals, though it’s rare to have one wander so close. The human approaches the throne, her eyes focused now. By the base of one stands a sculpture of a peacock, painted in brilliant colors, its tail fanned out in display. The other throne is unadorned, but it need not be. Recognition replaces the bewilderment on her face. Now is as good a time as any. I step out from behind the thrones. To her it appears as if I’ve materialized out of thin air. Surprise makes her stumble backward fast, too fast. She trips over her own feet and lands in a sprawl before the thrones. Which is just as well. They may not mind the occasional wanderer to come in, gawk about, and not pay the proper respects, but I do. There is protocol to observe, respect to be given. Naturally, she is terrified, but she is also safe within the boundaries of a dream and believes no real harm can come to her. Ah, how sweet. How naïve. How charming. Her fear is conquered because of this belief, misguided as it is, and she accepts my hand. “Thank you,” she says. Up close I see that she is more woman than girl, though barely. Her stomach is rounded slightly, swelling with growing life. She is waifishly thin otherwise and wears a haunted look about her. It is need and desperation that has brought her here, I realize as I study her. She went to bed this night, groping for something, anything, and my lady, in all her wisdom and generosity, offered the woman her hand, much like I had just done. In this instance, I was my Lady’s hand. “You have a petition to lay into the goddess’s hands?” I prompted when her silence continued for too long. For a moment, I think she may not speak after all. My newly found patience starts to fray around the edges. Before I can snap at her again she answers. “My husband,” she offers. Of course. There’s a story here, and I need to hear it. I can feel Hera’s gaze on us, suddenly, though I dare not look her way. For whatever reason, my Lady wishes to remain unseen, and who am I to go against her wishes? I listen, as she tells me of his late night jaunts, to return home exhausted and ill-tempered, of the missing money she suspects he’s spending on his mistress. When confronted, he has denied her accusations, but the behavior has not stopped. The stress is starting to weigh on her, and she wants to know for sure, on way or another, before her child is born. She seeks knowledge, and support. Alone in the world, but for her husband, she has no one else to turn to. So, she cast her despair out to the winds in an impromptu ritual not hours before going to bed, and here she was, at our doorsteps. The goddess has always had a soft spot for young brides. We will look into this, my goddess speaks for my ears alone, still unseen, still watching. Send her back to her bed. “We will find your answers for you,” I relay the message to the human. Setting my cup of wine aside, I take her tea from her and kneel before her. “Give to me your worries, so that you may rest. Find peace in your dreams. By next moonrise, all will be known.” I lay a kiss upon her brow, and her form, never more than translucent in the first place, dissolves. Hera steps out from the shadows that had been masking her, much the same way as I had earlier. However, her appearance does not surprise me. She wears her glory around her, like a robe, shining with a brilliance that would blind a mortal. It only causes my own immortal eyes a slight discomfort. Her face is unreadable, but her eyes are warm with compassion. She does not want to jump to conclusions without investigating for herself, but, as I’ve said, she has a soft spot for young brides. Woman are, even in these modern times, entirely too dependent upon their husbands. Lip service would have you believe that customs had changed with the times, but more often than not it is not so. Girls are raised to defer to their men in any number of things, and when they are too independent, their peers treat them unkindly. A woman who does not embrace the role of wife and mother, who does not put family first is thought of, at best, as cold. This time I was surprised. Zeus appeared much like his wife had, though until my queen announced his presence, I had no awareness of him being nearby. “It bears checking out,” he says. Which is what she knew he would say. And then they are gone. I find myself left alone in the chamber, before a warm fire, with enough food and wine to last me for days. There are days when I regret giving up my solitude to serve the goddess whom has been most kind to me. Today, however, as I kick my feet up and settle back to indulge in some well-earned time off is not one of those days. Around me the temple is silent. The gods are all bent on their own affairs. I am blessedly alone, and I intent to enjoy it. Hera was not lying when she said they would not be gone long. On earth the sun is only beginning to set when she and Zeus reappear. Her face is as unreadable as ever, but his is fully animated. I see humor, bemusement, exasperation, impatience, and determination all dance across his features. “Bring them,” he commands me. I go to fetch them. I am not this servant to command, and he knows this. Rarely, in our history together, has he ordered me about. Still, one does not argue with the king of all the gods. I find her first, at her small apartment, surrounded by tissues and misery. Bottles of pills sit by her side, unopened and mostly full, but I do not have to guess to know in which direction her plans lay. Still fully awake, I seize hold of her before she can protest, and whisk her away. Her husband I find second, sitting at a cafeteria table in the middle of some factory. He is sweaty and filthy and exhausted. Though he has never seen me before, he does not seem overly surprised. That tells me a great deal of his weariness. With my other hand I grab him and then we three are off to Olympos. I deposit them both before the thrones. The thrones are occupied now, with Zeus and Hera sitting regally before the two humans. Their brilliance had been toned down, for the sake of the humans, but they looked like giants to the mortals. She stands gapping in shock. He drops to his knees before the throne with something akin to recognition on his features. “Lies and deceit,” Hera spoke almost immediately, her voice ringing out through the temple, “cannot uphold a marriage.” Her words are clipped, giving the humans and myself the impression of impatience. I feel a sense of vindication when the husband drops his head to study the ground below his knees. Beside him, his wife is crying silently, though I cannot be sure if she weeps in sorrow or in amazement. The sight of my Lady and her husband can overwhelm the senses. The mortal man ducks his head further. One does not argue with the goddess. The man turns to his wife and takes her hand. In that moment, we are forgotten to them. This is about their lives, their marriage. We may as well be flies on the wall. But, we are curious flies. We stay – or rather, we keep them here – and we watch. The confusion vanishes, and though she is still angry with him (as she ought to be) she is moved to tears. They hold one another and cry, and for a long while we, great immortal flies on the wall, watch them. “Yes,” the two say in unison. 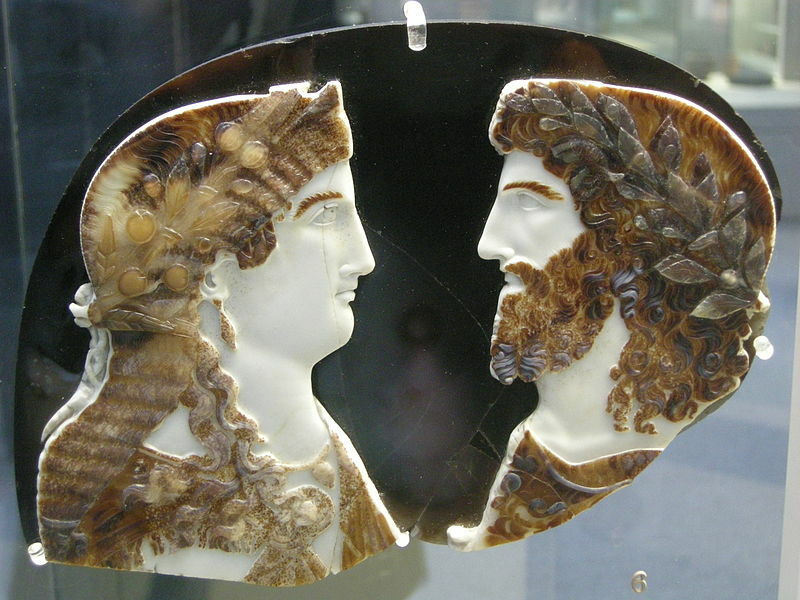 I arch my eyebrow, thinking back upon the mighty rows she and Zeus used to get into, back when they had first wed. The heavens would shake at the violence of their quarrels and their passionate reconciliations. Wisely, I hold my tongue.